The news of swirled-down grasses and plasma orbs in Hidden Valley, California would have drawn many people had the exact location been identified, but Lake County was the only clue given. I was able to visit the Hidden Valley Lake area ten days after 32 areas of downed grasses had been reported by an anonynous local resident, who recounted having observed bright white and golden colored plasma orbs on several occasions in the early morning hours. Following the water was my first search priority, starting with the area between Spruce Grove Road Extension and the small river that runs over a wide rocky bed. There I quickly found a large area of downed grasses that lay in loosely twisted swirls that extended for about 45'. All of the grasses in these areas had apparently benn swirled and matted down near the ground, while other flowering plants remained green and standing upright. The stalks and seedheads of the grasses alone were stained in subtly shifting hues of red, purple and pink among the semi-dried grasses, and I sat down to look at the beautiful energy changes present in the plants. After a time watching the small red ladybugs moving among the red, tan and green stalks I settled into a meditation, thanking the Earth for her gentle and beautiful lessons. As occurs every time I quiet my own body's rhythms, the presence of a deep infrasound humming envelopes my whole being, bringing my mind and heart into resonance with the Earth. One photograph taken in the late afternoon captured a plasma orb flying just above the grasses, as if to joyfully give its light as a clue to the origin of the colorfully stained grass swirls (inset above). I did not see this plasma orb as it passed before me, but the light of the camera flash was amplified by the resonant HHO plasma as it whisked by for my benefit. I did have a sighting that evening of a large bright plasma orb over the eastern side of the valley, which moved and wavered only slightly over the course of 4 hours during the night. This is now a common event in my experience, and the experience of many others living in resonant hotspots, including the anonymous Hidden Valley resident who posted the original report (see below). 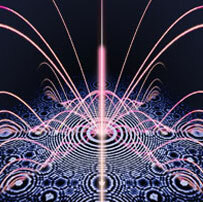 For many years now I have had interactions with luminous orbs and more often flashes of various colors that I have been able to understand as manifestations of HHO plasma, which I describe in detail (in the second chapter of my book Tesla's Rebirth) as energetic surges occurring along the invisible pathways of infrasound standing waves. These HHO plasma streaks have recently been photographed as larger HHO plasma plumes which formed over the night of 9/9/9 in Longview, Texas. The Longview plasma plumes were captured in the long-exposure photographs of a motion-sensing gametrail camera that had also captured photographs of groups of plasma orbs at the very same spot earlier that night. I had already become familiar with bright red discoloration in swirled-down plants during previous years of crop circle research at the Solano County circles of 2003 and 2004, as well as the Red Bluff formation of 2007 directly north in Tehama County. The redness in the impacted plants has been previously observed in many crop formations, including well-documented samples from corn and bean stalks. Analysis of the stained grasses in previous studies has attributed the discoloration of the plants to exposure to microwave energy from aerial plasma orbs. The luminous plasma orbs irradiate the low grass for mere seconds, causing the build-up of anthocyanine in the cells of the stalk and seedheads as HHO plasma is formed above the ground, inducing strong electromagnetic fields that consciously direct the geometric energy flow as desired. Several large swaths of downed and reddened grasses became apparent as I surveyed the area throughout the afternoon, and spent the following day there between the road and the river. The same features appeared in all of the 7 areas I was able to visit and photograph. I went though many sets of batteries to get just about 80 digital images, having been prepared for the battery drainage that tends to occur in these circumstances where ground-level HHO plasma forms at the focal points of infrasound standing waves. 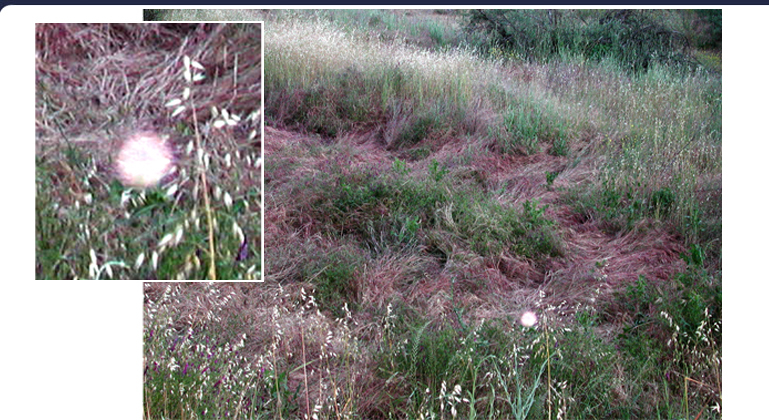 In every location, all of the downed plants were grasses depressed in chaotic direction twists and swirls, seen to be layered in a few places, but generally lacking organization (as seen above). 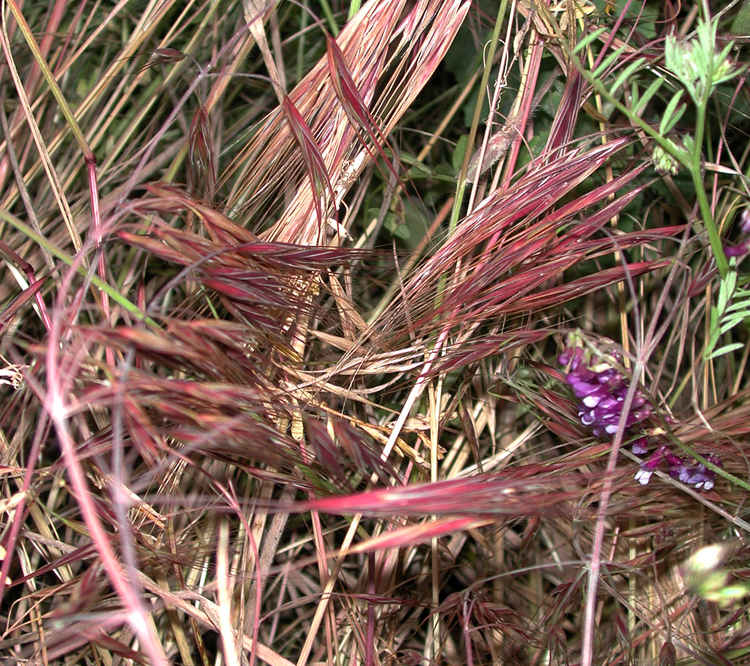 Most of the downed plants showed anthocyanine staining along the stalk or seedheads, which gave the down areas a bright pink hue that was immediately noticable from a distance. I was unable to find any especially elongated or blown out nodes, but many of the most reddened plants displayed one or more angular bends as seen in the 3 close-up images displayed on this page. This energetic event is one of several that have occurred along a north-south alignment, including crop circle events as well as spontaneous fires involving superheated metals in a cellphone in Vallejo and a parked car in San Mateo. 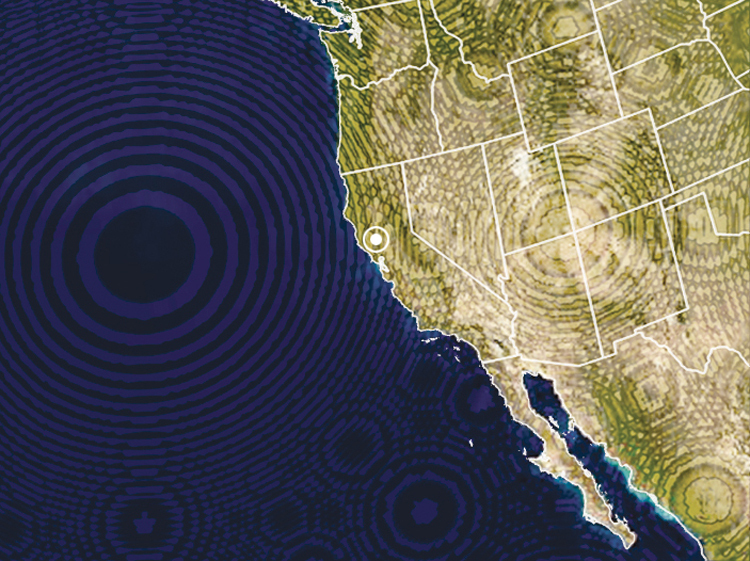 Following the same alignment due north through Washington state, I've collected reports from all kinds of anomalous events taking place in the Seattle area, including loud infrasound booming events as well as spontaneous fires, electrical outages and underground explosions. The underlying cause of all of these unusual events and their precise north-south alignment is the invisible and inaudible natural force of infrasound standing wave resonance focused onto the various hotspots by the Orion pyramids of Giza, Egypt. Hidden Valley Lake, California (38.80°N 122.58°W) is 7,406 miles from Giza, or 29.75% of the Earth's mean circumference distance, laying along the juncture where the north-south energetic axis crosses another alignment of infrasound resonance passing through the Hopi four-corners area of the southwest and the giant Pacific vortex to the west. During my two days of research in the many swaths of swirled-downed grasses along the Spruce Grove Road Extension and elsewhere, I was surprised to see a helicopter land right near the junction with Highway 29 which turned out to be responding to a double-fatality car accident involving an elderly man residing on that same road. The highway entrance off Spruce Grove Road Extension is dangerous as has been pointed out by residents several times prior to this incident without any safety precautions being taken. This negligence reflects the dangers on a greater scale that exists with all automobiles altogether as we approach the magnetic reversal of December 22, 2012, which will disrupt electronic equipment before igniting it spontaneously. All metal objects can become deadly hazards when superheated by intense infrasound standing waves that can even be heard by people living at energetic hotspots near sacred sites all over the world. I have been watching bright lights in this valley for weeks now! It started weeks ago, these small BRIGHT lights appearing at night in my back yard. Then I started noticing them in the hills surrounding us. (This is a very small valley). They move around in the early morning hours. Last week I saw the most beautiful lights rotating around something on the hill, I had never seen such pure white lights! After about 30 min. only two lights remained at that spot. Some of the lights are also golden in color. My family has also seen the lights late at night soaring across the skies. They look like stars at first but then they zig zag around often disappearing. I have lost a lot of sleep lately to be sure. During my hike around the valley this morning, I noticed for the first time what I nicknamed "Lake county crop circles" The grasses are about 1.5 ft high right now and it looks like something has just pressed them down in odd rotations. NO animal has done this, trust me. They are ALL over the valley where I live. I have never seen anything like it around here. I believe I counted 32 of them and this is in a small area around my house. I have also seen what I thought were stars flash very bright, sometimes red but mostly white. They either stay in place or fly away after. I am not sure what is going on here in Hidden Valley, but whatever it is, it is increasing. I have only shared this with family as I DO NOT want them to be scared away. And I cannot believe my neighbors haven't noticed! People just don't even look up anymore, they are so into their own heads. About 3yrs ago my daughter and I were driving near a naval weapons stn. in Concord, Ca and we saw the hugest black UFO between two hills...just hovering! So we are not new to this concept. Please write back soon, something is going on around here and like I said it is increasing. But I do not want a bunch of nosy looky loos coming around scaring them away!